Oster is celebrating 70 years of blending excellence with an Oster Beehive Bundle Pack Sweepstakes! 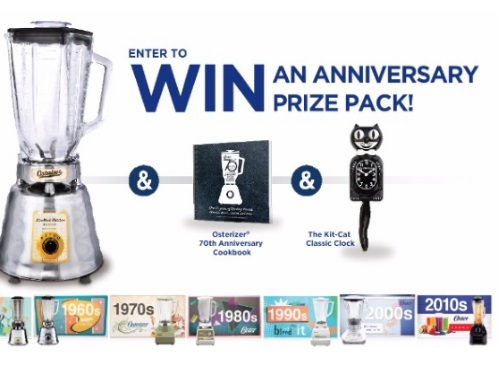 To enter this contest fill-in this short form at the link below for your chance to win an Oster 70th Anniversary Blender, an Osterizer 70th Anniversary Cookbook, and a Kit-Cat Classic Clock. Sweepstakes close Sunday, October 9, 2016 at 11:59 PM EST. I still have my mixer from when I got married 36years ago in perfect conditions and used a lot.